Chili Bowl Diary Night 4: Anytime you have a multiple night show like the Chili Bowl there is going to be one night that isn’t as exciting as the rest. There is going to be that one night when things are just a little bit off. Whether that is because the competitors are tired or whether it’s those of us that are covering it are tired, or whether it’s because the surface has taken a beating. There is that one night when things are just a bit off. Tonight was that night in Tulsa. The track is made with a clay dirt surface that is stored from year to year and every few years they add new clay to the mix to keep it alive. Yes it is a living surface. Just like most outdoor tracks are mulched and left to sit under the snow and rain of winter and early spring and then the mulch, usually leaves and compost, is worked into the surface and it is over watered and allowed to sit and then worked again to prepare for the new season,the chili bowl surface is stored under cover and treated the same way during the year. This surface was used for the Tulsa Shootout last week and it ran 214 races. It was worked and grated and it has now hosted The Chili Bowl a week later. The surface is tired. There were some ruts in turns 1 and 2 early on in the evening that they tried to work out. The cushion or the loose dirt became very heavy up at the wall and had to be scraped back down. As fantastic as she is and as exciting as she can be she is simply tired. She needs a lot of love and work tonight to get ready for tomorrow when she will start with K Mains and work her way up to the big race the A Main. She will be ready. She always is. But tonight she was tired. “The track tonight was as hard to pass on as any I have been on,” said Dave Darland who came home third tonight. Darland is a multiple time champion on dirt and asphalt and is well versed in tricky surfaces. The winner tonight was a second generation winner at the Chili Bowl. 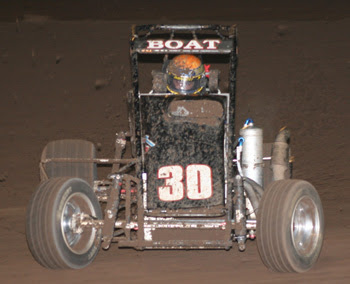 Chad Boat’s dad, Billy Boat won the Golden Driller in 1997. Tonight Chad took the first step to following in those footsteps. “I’ve been coming here for seven years and only made the A once. So it's definitely the biggest win of my career." Said the young Boat who dominated flag to flag in tonight’s A Main. Tonight had disappointments. Perhaps the biggest belonged to six time USAC Sprint Car Champion Levi Jones. Jones, who had a strong night staying just in contention, came out of the box in the A with a strong start. Running second, he had to stop to avoid hitting a car that was upside on the track on the backstretch. Coming to stop he was put to the rear of the field and could never come further back up than 13th which will relegate him to the B or C Main tomorrow. The night was long. Longer than the two preceding nights of the event; it was peppered with wrecks flips, rolls, and just flat pieces that broke on the degrading surface. Richard Petty once said, “I’d rather be lucky than good.” At the Chili Bowl you have to be lucky and good. Coming through the soup can be done. It has been done. But it’s no easy task. Every trip to the track brings a new set of risks and obstacles. Coming through the soup, starting from mid pack back in the A takes iron will and a set of skills that never waivers and most of all a car that will stay under you every step of the way. Even with all those things in your favor, you still have two huge obstacles, Sammy and Kevin Swindell. Will this be the year for a new winner or a repeat from the past? Will Tony Stewart come from the 12th starting spot to claim his third Golden Driller? Will Cory Kruseman work his way through to take home his second? Will Dave Darland show the prowess that made him the people’s champion and take home his second? Only tomorrow knows. It’s a 16 hour day of racing. Pick your driver. Then hold on tight. Cause the Chili Bowl Nationals will be won by someone tomorrow night. I know you said they bring in the dirt, but I did not realize they reuse it. That is very intersting. Thanks for sharing it with us. Yes it was a long night. I dont remember last year having this many rolls and flips. I am sure the drivers thought it was a long night as will. I love how you put the stats at the end. Nice to be able to go back and see how everyone did all night.